Known for its amazing out-of-the-box interiors, The Bar Terminal at Fort has come up with something lot more exciting for you. Get ready to have a great time since they are hosting an International Board Games Night! No matter how fast the time skipped and brought us to the era of smartphones and virtual world where we socialize through apps, nothing can replace the feeling of having a get-together with friends for an actual board game. To bring the fun-time back, The Bar Terminal is hosting this crazy night where we can go and play the following board games, with people we want! 12) Hey, That’s My Fish! Playtime calls for hunger! Hog on to scrumptious starters from the menu like French Fries in Cheese Paprika Sauce, Classic Cheese Corn Ball, Nachos, Flavour Cheese Bread, Chilly Cheese Toast, Garlic Bread, Bruschetta, Hare Bhare Kabab in Cheese Sauce, Summer Veggie Roll, and Paneer Chilly. Not only these, Mushroom in Oyster Sauce, Crispy Corn Chilly Pepper, Veg Manchurian, Butter Chilly Potato, Gangari Aloo, Chatpate Aloo, Paneer Tikka, Paneer Achari, Cheese Open Rumali, Open Rumali, Khichya Papad Churi, Khichya Ki Churi, and Shezwan Khichya are also worth a try. So take out the time tonight and hit The Bar Terminal to bring back the great times! 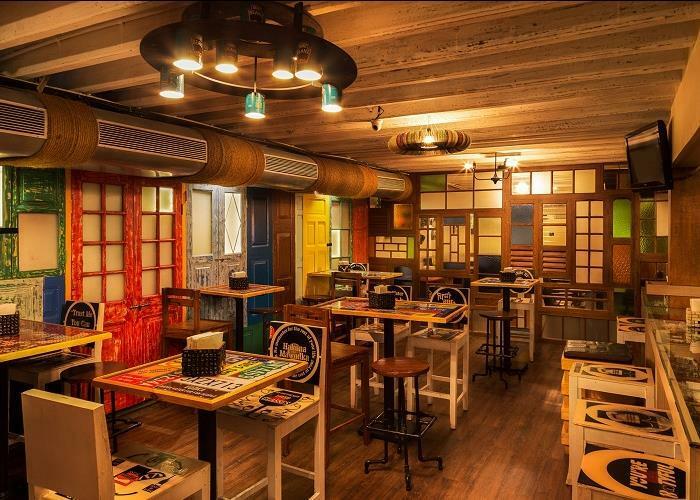 #FFDxZomato: Top 5 Pet Cafes In Mumbai With Zomato Gold!